Hubsan X4 H107L Quadcopter is a classic model among the beginner pilots. The first model was released back in 2012. Since then it was updated with some extra features and it is one of the best selling budget quadcopters for beginners. This tiny quadcopter can be really easy to use. It is RTF (ready to fly) model. You will learn all the maneuvering tricks, what you need to know if you start to venture into the world of quadcopters. This little beast can be a perfect toy to play with. Why do I call it beast? Because it is really agile and responsive. 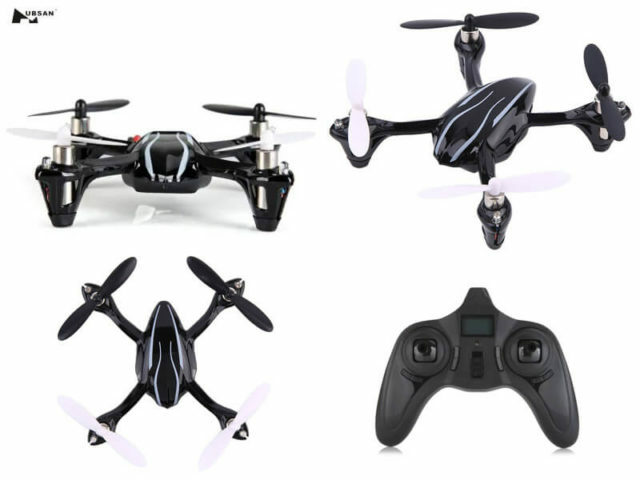 It is a perfect beginner drone with an air of a racing drone feel. The Expert Flight Mode allows you to truly feel like a drone racer. It is hard to learn the controls in this mode but through learning, you can be an expert pilot. 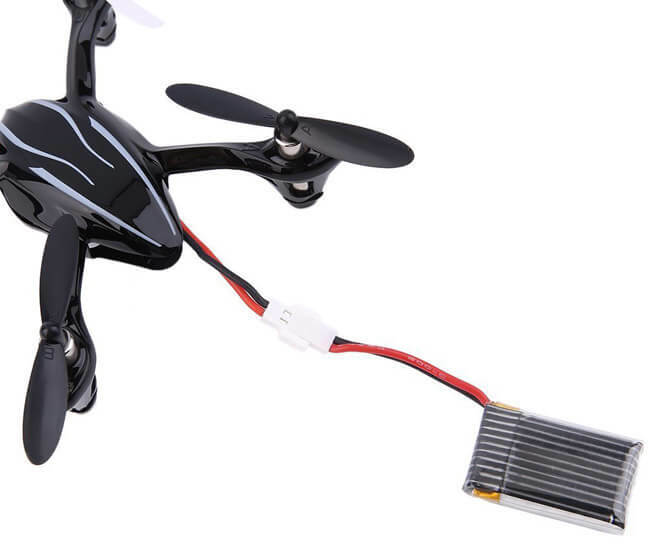 Let’s have a look in detail what Hubsan X4 H107L Quadcopter can offer. In the box, you will find basic and usual elements. I would be preferred a propeller guard but anyway you can purchase some extra spare parts and extra batteries too. So what you get? The Hubsan X4 H107L Quadcopter, an RC transmitter which works on 4 channel and on a common 2.4 GHz frequency, some spare propellers to easily replace the broken ones. Yes, you will crash this quadcopter really often, like anyone who is beginning to learn to pilot these machines. It is not a big deal. Thanks to the durability of the materials that Hubsan X4 H107L is made of, it won’t be a problem. The propellers are color-coded to ease the installation procedure. It is really important to install properly the propellers. If you put them on the wrong order on the arms the quadcopter simply won’t leave the ground. You will also find in the box an USB charging cable, for charging the battery. After the red light turns off on the USB charger it means that the battery is fully charged. A full charge takes about 40 minutes which is not bad compared to other models. It is a remarkably handy feature to charge up the battery even from a laptop. Hubsan X4 H107L as I mentioned earlier is a tiny piece of kit. It perfectly fits into the palm of your hand. Not bigger than a smartphone. It only weighs less than 30 grams, 28 grams more exactly without the battery. With the battery, it is around 120 grams. The lightweight nature of this little machine can be an advantage and a disadvantage too. It can be flown indoors and outdoors. The wind is an enemy for this little animal. It can be carried on easily because of the lightweight nature. 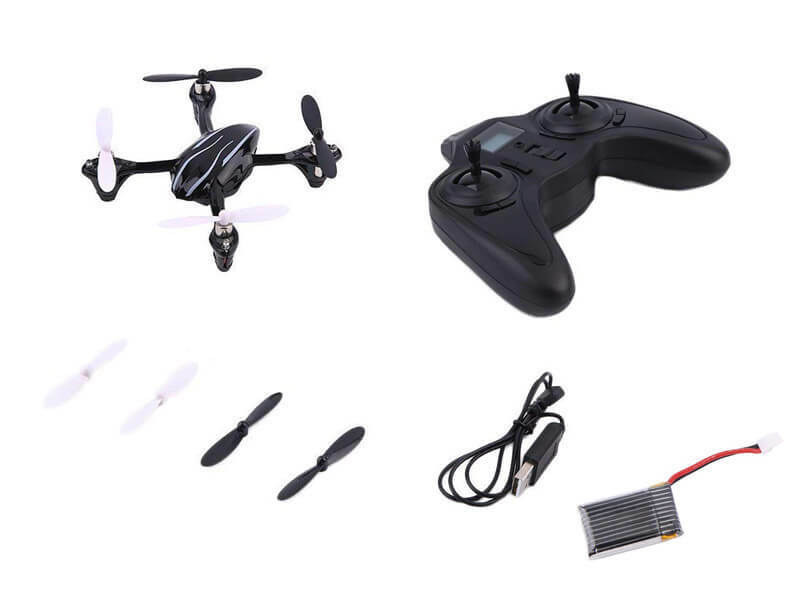 In clear weather, you can fully enjoy the agility and responsiveness of the Hubsan X4 H107L Quadcopter. The design of the Hubsan X4 H107L looks somewhat aggressive, but not too accentuated. The small rubber landing feet helps to absorb the shocks of hard landings. The drone’s body is made of a durable plastic one-piece frame. On the arms, you will find red and blue LEDs. This will help you with the night flights, you will notice the orientation of the drone. Also, the flashing lights indicate the weak power of the battery. The transmitter is a basic one. It looks like a game controller and has all the basic functionalities that have to have. It has an LCD display, two sticks, trim and flight mode buttons. The display shows important information about the flight modes, rates, and other stuff. The joysticks are for the control of the drone elevation, speed, and orientation. The trim buttons help to fine-tune and stabilize the drone’s behavior in the air. 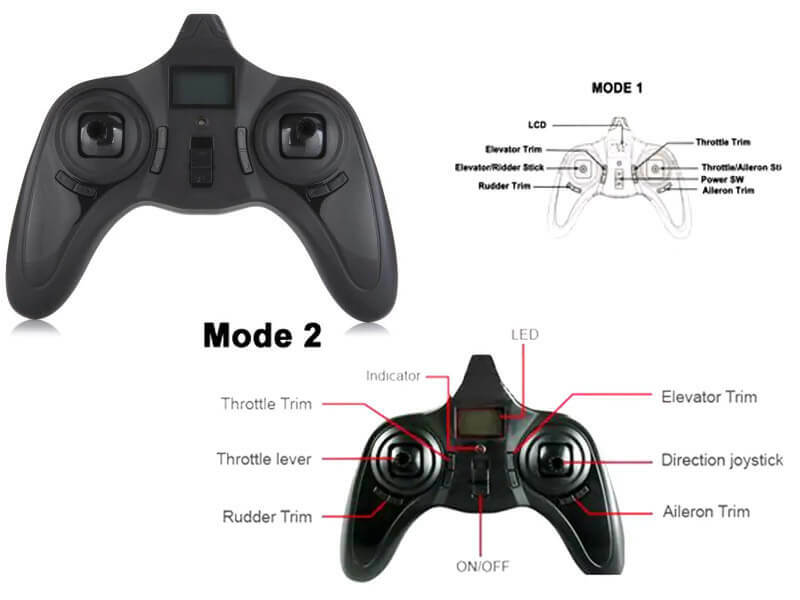 The flight mode buttons serving the role of increasing or decreasing the transmitter sensitivity. The transmitter signal has a distance of 30 meters, but in many cases, you can reach a 50-meter control distance. It is important to read the manual and calibrate the transmitter and quadcopter before the first flight. After the transmitter calibration, you have to pair it with the drone and then calibrate the accelerometer and the gyroscope of the drone. You need to put the quadcopter on a flat surface to do the calibration right. In the air, Hubsan X4 H107L is a stunt master. Fast responses, good maneuverability and a really agile behavior that represents. 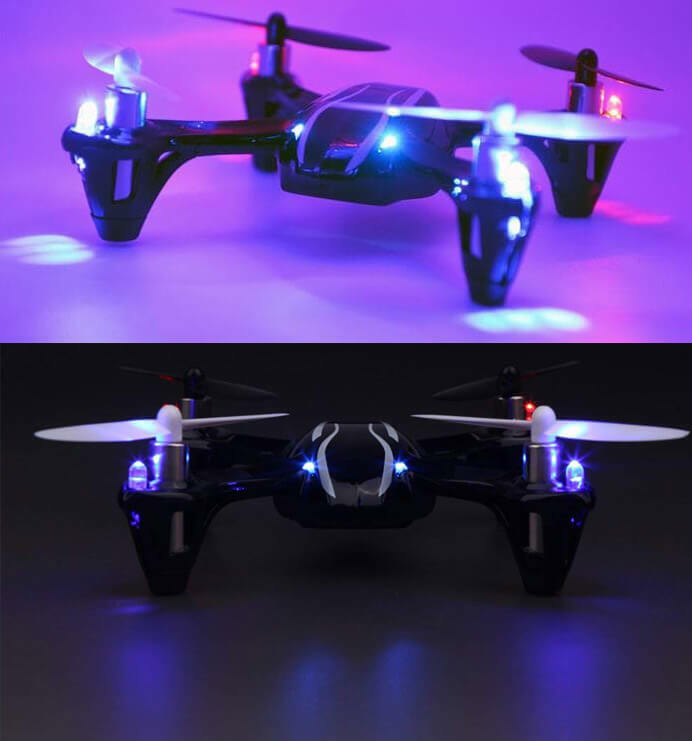 The flight time of this little creature is about 6-8 minutes, but if you want to have fun longer you want to have some extra batteries in your pocket. For the entry-level pilots, it is advisable to use the drone in the normal mode to familiarize with the controls. The Expert Flight mode needs some practice to handle properly the quadcopter. Overall Hubsan X4 H107L up in the air is remarkably stable. It auto corrects to level after you let go of the joysticks. The proper calibration is important to help the 6-axis gyro sensor to work properly and to maintain a still hovering in the air instead of drifting in any direction. 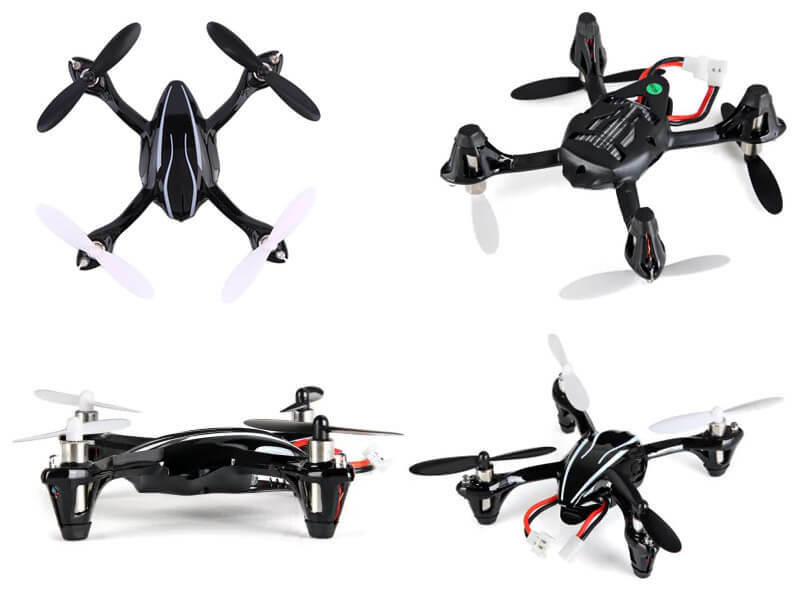 X4 H107L quadcopter is also capable of 360-degree flips and rolls. Hubsan X4 H107L is a perfect entry-level quadcopter. It has a history and it is pretty popular since the first model came out. This model has no camera, but if you think about the purpose of this quadcopter, simply learning to pilot and having fun with, you won’t miss it. Although there are models with a camera at a higher price. Speaking of price, it costs only $20.99 or £26.95 depending on what continent you want to buy. Overall speaking Hubsan X4 H107L quad is a perfect choice if you want to learn how to fly a quadcopter. It is really cheap and you will find spare parts for this drone easily. If you are interested in what 2018 can offer you on the beginner drone market, you can check out this top 5 quadcopters for beginner comparison and make a choicer according to your budget and preferences. 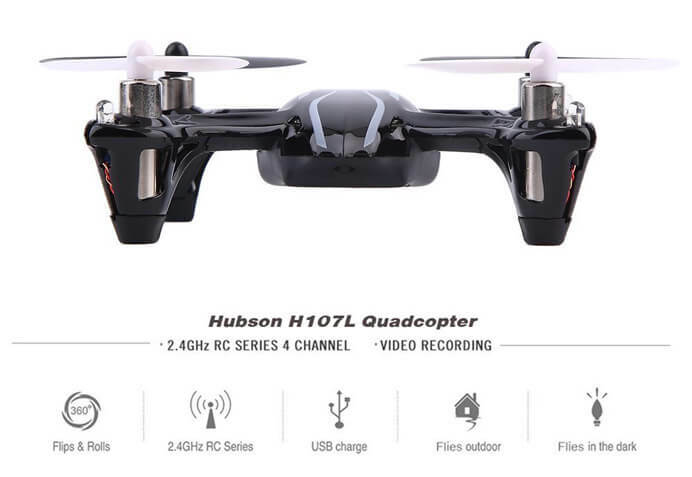 Hubsan X4 H107L is undoubtedly worth the price.